One barometer of popular support did not augur well for Alderman Eli Melky’s youth curfew motion: the public gallery at last night’s council meeting was half empty. A few people from the youth sector had turned up and Acting Commander Michael White from the NT Police was also there. But the 1000 plus signatories of the petition circulated by Alds Melky and Samih Habib Bitar, who seconded his motion, had stayed away in droves. Perhaps its defeat had been accepted as a fait accompli. Opponents of a youth curfew, who had signed a petition organised by high school student Gavin Henderson, were also absent. Mr Henderson himself, however, had followed through and gave a short presentation in support of his views. He had gathered 393 signatures, which he saw as “great support”. But decisions, he said, should be based on the evidence, not on what is popular. He had circulated three documents to aldermen – a report by the Youth Round Table, another by the South Australian Council of Social Services, and a third by the non-government youth sector in Alice Springs. He claimed the evidence shows that crime does not decrease with the imposition of a curfew; rather it shifts to other places. A curfew would also cause unnecessary tension between youth and police: young people would feel targeted and would be reluctant to turn to police for help. He also pointed out that there are local organisations and services responding to young people who are on the streets at night, mentioning Tangentyere Council, Congress, and the Youth Street Outreach Services. He called on council to “invest in young people”, to provide better support to children, youth and family services and a sustainable program of events for young people. Ald Bitar asked him if he would feel safe to walk home from the cinema at night. He said no, his parents would pick him up; if they couldn’t, he’d find a way to get home with a friend, but he wouldn’t walk home. Ald Bitar, appalled that a young man would not feel safe to walk home at night in Alice Springs, later cited this answer in support of his argument for a curfew. The issues were hotly debated by aldermen. Supporters of the motion – Ald Murray Stewart in addition – spoke with feeling about the protection of children; having to control juvenile crime was their other core theme. Ald Melky admitted that a blanket curfew may not be seen as fair, but said that is the case with many of the rules young people must live by. He said there was “overwhelming evidence” of crime being committed by young people but did not produce that evidence in a form convincing to his colleagues. Referring to the number of signatures on his petition, he said that was evidence of support for a curfew, although a decision should not come down to numbers: the support was enough to bring the issue to council’s attention. Ald Sandy Taylor, who chaired the debate, said Ald Melky had made “broad sweeping statements” about youth crime but hadn’t provided hard data. She said she had looked for hard data but hadn’t been able to find any, but had noted a “trending down in the media” in the reporting of youth crime. Mayor Damien Ryan said he didn’t consider media stories as evidence. He was concerned that young people were being seen as a threat, rater than as “valued members” of the community. He also noted the contradiction in the curfew supporters’ opposition to blanket restrictions of alcohol, yet acceptance of a blanket measure in regard to youth. He said Ald Melky did not give credit to the work done, for instance by police, citing the results of Operation Thresher. Police had released the results of the operation for October 1-17 yesterday. With regard to youth their release said “38 Youth Conveyances” had been conducted (presumably “conveyances” means taking young people home or to a safe place.) They had also done 75 bailee checks. The youth justice list yesterday was extensive, with 42 matters before the magistrates court. One young person had 13 property offences to answer to and two breaches of bail. Another had three property offences and four breaches of bail. Ald Bitar said he felt sorry for the police having to “put up with the mess” but crime was “going up”, “politicians fail us” with “bandaid measures” and “half the town has left already”. Ald Taylor said she wouldn’t consider the government’s $15.5m investment as a bandaid measure. Deputy Mayor Liz Martin said no-one disputes that there are gaps in services for youth and that there are core issues that need to be addressed, with some young people not safe at home. She couldn’t support a blanket curfew, which could force young people to “the outskirts” where they may be more vulnerable. Council should support programs and activities to get children off the streets. Ald John Rawnsley criticised the wording of the motion, particularly its failure to define what a legitimate reason for being on the streets would be, and what the boundaries of the area covered would be. He said a curfew would stretch police resources too far, taking them away from their core business. He was upset about the way supporters of the motion had framed the debate in the media, suggesting that people who don’t support a curfew accept young people being out at night and being vulnerable. He said the presence of very young people on the street shows the need to improve child protection services. Ald Brendan Heenan thought that kids would treat a curfew as a game. He wanted to know what the “KPIs” (key performance indicators) for youth organisations are and whether they are “performing to their charter”. He said children being on the street at night is not a children’s problem, it’s a parents’ problem: parents need on-going counselling; children who can’t fit into a normal school need specialist teachers. Ald Jane Clark was worried that council would be seen as “belligerent” by continually writing to the NT Government asking for the same action (the Tenth Council had written twice to the NT Government on the issue, with the government declining to support a curfew). She wanted to see council “take the front foot in the area of our expertise” – programs and services. She said media reports of youth crime were “exaggerated,” and “not backed up by the evidence”. “Well said,” responded Ald Taylor, making clear her own strongly held views despite being in the chair. She said “a lot of us” would concur with Ald Clark’s position. Ald Stewart argued that not supporting the motion would be “another example of demographical discrimination”. Council’s passing of its public places by-laws had shown that it would not accept such discrimination, that standards would be lifted “no matter who you are”. He also said that a curfew would help white middle class families, backing up what they are trying to do at home. He cited the example of a 15 year old girl from “a good, middle-class white family” who had run away from home and was now “in the judicial system”, whose mother “in tears” had urged him to support a curfew. Ald Taylor said accused Ald Stewart of “targeting Aboriginal youth in town”; Ald Stewart defended himself – “I said quite the reverse”. The temperature was rising. Mayor Ryan only just stopped an expletive leaving his lips, suggesting to Ald Bitar that “this piece of ….” (the motion) was a bandaid solution. Ald Melky referred to his work with two young Indigenous runners, the kind of opportunity he’d like to see given to every young person in town. He said while the curfew would apply to “all colours”, it was more likely that Indigenous kids would be in the streets as this is an Indigenous place. Ald Rawnsley accused Alds Melky and Stewart of playing “the race card”. He again returned to how “badly written” the motion was. A rule needs to have a consequence if the rule is broken, he said, and the motion did not include a consequence. Ald Clark said it was clear that the majority of aldermen supported a “more sophisticated approach” and urged that the motion be “put to bed”. Ald Stewart defended himself from Ald Rawnlsey’s comment on the race card, referring to the strong Indigenous families he mixes with and his “100%” belief in the integration of all peoples. Ald Melky said he would not apologise for not being more sophisticated, saying he had gone out of his way to be basic. He said everyone understands what a “legitimate reason” for being on the street would be; everyone understands “adult supervision”. His final comment was to challenge his critics “to speak two languages fluently” (Ald Melky is bilingual, speaking Arabic, the language of his native Lebanon, and English). Ald Taylor concluded the debate by quoting from a 1993 review of curfews as a means to control crime: “Those most in need of social support are those most likely to be subject to a curfew and most likely to fail its conditions”. The vote, by show of hands, was lost, with only Alds Melky, Bitar and Stewart in favour. 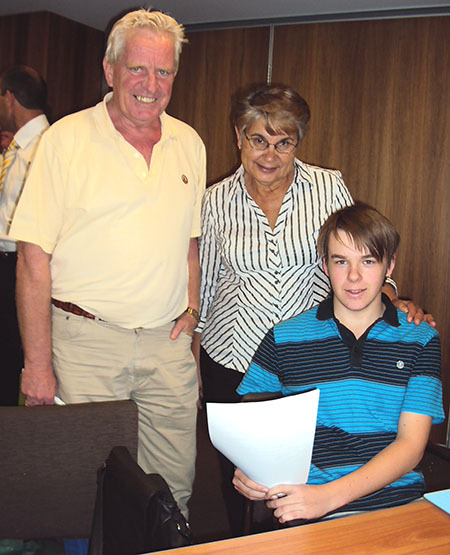 Pictured above: Young opponent of a curfew, Gavin Henderson, who organised a petition against the proposal, with supporters, counsellor and independent candidate for Greatorex at the next NT election, Phil Walcott, and Alderman Sandy Taylor, chair of council’s Corporate and Community Services committee. 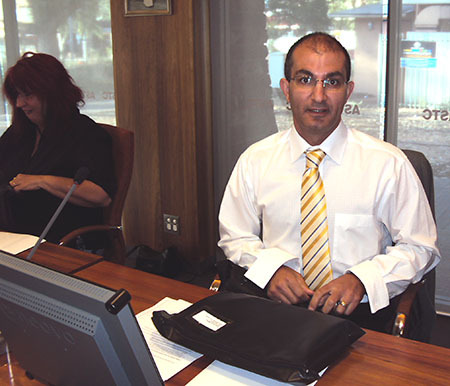 • Alderman Eli Melky, author of the motion, in the council chamber before the meeting. John, my initial response was an admittedly angry rebuke to aldermen, some of whom I hold in great respect, over behavior that has emerged regarding Eli Melky. The intensity of the dislike the aggressive bullying intolerance is really deplorable especially when some seem quite willing to sacrifice long held beliefs in order to attack him. My comments come not just from the article but from what I have observed first hand both at Council and through a good many conversations with a number of aldermen. While council is playing petty one-upmanship games, people – many of them children – are hurting. Of course council doesn’t control law and order but a well respected council can and should be an enormous influence on government decisions. That means making strong, visionary, useful points to government, then having the intestinal fortitude to stand behind those decisions. What Alice doesn’t want is a cringing, ingratiating, cannibalistic council that may raise plenty of eyebrows within government, but generate precious little respect. Furthermore and finally, what Alice’s needs is a council that represents its citizens not the glorious careers of aldermen. The recent criticism of Action for Alice by some in council raises many questions about just who councillors think they are and who they think they represent. The membership of Action for Alice during peak moments of the town’s anxiety earlier this year bordered on 500, mostly businesses. That, John, is a huge majority of local business! Our wealth generators and our employers! Steve, I’m glad the attention has turned to a debate between you and me. I do note, however, that you have still refused to respond to the points put against the blanket curfew proposal. Your follow-up comment also goes all over the shop. This will be my last response, too, because I don’t have time to continually correct your comments. So, here it goes again. First, we could talk about voting support in Alice Springs but it’s not relevant to this debate, and I’m not sure why you would be the person to bring this up. The supposed facts you put forward are wrong. Second, you claim my contribution is a “never ending spiel of Labor party propaganda” and that I have “unquestioning support” regardless of the town’s voting patterns. My record shows otherwise, and as Alderman I have always had, and will continue to have, the best interests of the town at heart. For example, to this specific debate I am open in saying that young people on the streets at night indicates the need for a more effective child protection system. If this is the fact I would say it no matter who is in government. Another example is, and only as recently as a few months, I moved a motion (with one elected member voting against) stating the community’s expectations for the same level of Police resources in time for summer as that experienced in March this year. I will openly support and encourage good ideas and contributions no matter which side of politics (or who) they come from. I wouldn’t have been voted in unanimously as Deputy Mayor if I did otherwise. Third, you claim that I have been here long enough to put into effect the answers. The fact is Council does not have sole responsibility for law and order. I know a few examples of efforts where elected members have shown leadership. Alderman Stewart advocated for a permanent police dog presence in our town and, shortly after, the police released a media statement saying it would do so. Alderman Melky argued for two additional Rangers as part of the current municipal plan. Mayor Ryan put in place a plan for Council to fund night security in the mall and this was later picked up by the NTG. I moved the motion described above. I know there are many other motions and directions put by other Alderman. None of these are complete answers, and there is always more to do, but it does demonstrate effort in an area where we have little power and limited resources. Fourth, you attack Council’s record and assume that by now we should have clearly developed policy. Again, Council does not have sole responsibility for law and order. And in any case, if there were easy answers, and following significant investments in child protection by the NTG and a Commonwealth intervention at $1.8 b in the name of “protecting children”, then I know we would not have the problems which afflict our town if the answers were easy. Fifth, you claim that you “don’t think you have to support a curfew as long as you have an alternative response”. As demonstrated by your other comments this is clearly delusional. Calling for a more effective child protection system where young children left unsupervised at night prompts a personal intervention IS an alternative response. Other responses have been suggested. Despite this, your lot keep running the line that if you don’t support a blanket curfew than you do not care for the protection and welfare of children. Sixth, you play the race card just as two movers of the motion did the night of the debate. And, in any debate, if the inference is drawn that I don’t care about Aboriginal children and want them to be treated differently because they are Aboriginal (and that I want them to be treated in a way where they are not cared for), I will call the accusers of this stance on playing the “race card”. I will also defend the views of many people against the blanket curfew (including many young people) as being based on the merits of the case and not their supposed lack of care for Aboriginal children. If you interpret the fear of being called racist as the reason why we have challenges in our community then your assessment is grossly distorted. The social challenges we face aren’t the result of examples such as Action for Alice being forced to apologise, they are the result of inadequate policies. (To the point about separatism see point eight below). to back your claim. Your claim is also incorrect. My post here is an example of my contribution in this area. As I said before, I don’t have the time to continually correct your statements. Yeh! John, you have the audacity to talk about the “debate”. Debate is for people with both ideas and open minds, given your contribution has been a never ending spiel of Labor Party propaganda and its pathetic justifications you obviously have neither. You’ve maintained your unquestioning support for the Territory Government and the Labor Party even though it’s demonstrably against the wishes of, or the interests of, a massive majority of this town’s population. I think the Labor Vote is somewhere around 20% isn’t it? Why is that John? You still thinking of putting your hand up for the Labor Party at the next election? I personally can’t think of a good reason why you shouldn’t. Your leadership skills and achievements absolutely match the criteria. So why is Eli, “the new kid on the block”, at forefront of attempts to do something about our youth problem? Where is what should by now your very well developed policy? Could it possibly be that this problem has escalated year by year on your watch and you don’t have one? How long have you been in council now John? Let me help you, you’ve been there long enough to have put into effect all the answers you think you have. How long do you think you would need before you came up with any kind of solution or even produced an attempt at a solution – another 10 years? You seem to be able to produce a remarkable spiel of reasons as to why we shouldn’t do anything or why something won’t work. Yet we never see from you as an individual or Council as a whole any kind of leading the way. You say you came up with some good policy as part of the other night’s discussion, so where is it? Where are the motions? The facts are that your intent the other night was aimed solely a shooting down the new chums’ motion. It was in fact part of the pathetic bullying power game that been running against any alderman who has the temerity to put a motion that could be construed as being critical of, or outside the policy of the Territory Government. This week gutted stance not only lets down the citizenry of Alice who rightfully expect that aldermen should stand up and vigorously represent their point of view, but as with all policies of appeasement, it has made our council a laughing stock on matters of public policy. It results in our town’s opinions being completely disregarded by a Territory Government that always bases its decisions for Alice on minimizing input. As for the rest of your points, John, perhaps you should have read a little more closely my strong language was directed at behavior not individuals and John, I don’t think you have to support a curfew as long as you have an alternative response. One which doesn’t involve DOING NOTHING AT ALL! Which, by the way, is now the position of Council since your rejection of Ald Melky’s motion obviously does away with the council’s previously held stance of supporting a curfew. Gutter Politics John? You mean like those who play the “race card”, use it as an excuse to do “nothing”! Even though the result is the absolute victimisation and destruction of those they pretend to protect! Would you like to give us a run down on just how well Aboriginal Centralians have done while people like you have been arguing for separate and different treatment? People argue that, John, because they don’t have the guts or the basic human decency to do the right thing by these kids no matter what their race! They do it because they’re scared of being accused of being “racist”, and you know what, John? That in itself is a blatant racist and uncaring act! Where else but in the gutter would I speak to someone like that? Steve, since your spray attacked several elected members I thought it appropriate to correct your statements, and to repeat a few points which I made the night of the debate and with little effect (because Alderman who supported the motion continue to run the same lines). First, if you read the article (and if you were there on the night) you would find that many of the reasons put against the motion were not even responded to. Your letter fails in the same regard in that it lacks any response to the reasons put against the motion. Second, you claim that Council “refuses to address” the problem which is supposedly the intent of the motion. This is incorrect. Council Aldermen who disagreed with the motion put their views forward as to what the correct method of “addressing” the issue is in their views (including strengthening child protection targeting vulnerable youth and putting responsibility on parents). These are options which should be considered in a suite of policy directions, but you seem to make the same mistake some Alderman do by claiming those against the motion do not care for the protection and welfare of children. Apparently, only a blanket youth curfew is the answer consistent with looking after children and all other proposals are inconsistent. Further, the motion is to ask another government body to ask the police to enforce the curfew, which is a world apart from the notion that Council should take on certain responsibilities (which it has in the past). Third, your point that only those who would be on the streets if there was a curfew are those who would likely break it fails to account for the argument that a blanket curfew would send the message to youth to stay “out-of-sight, out-of-mind” and in the dark corners of substance misuse and violence. This wouldn’t be the case for every youth, but it is the message which would be sent. Alderman Taylor’s quote, as I read it, points to the fact that we need to consider what the consequence is for those who break a curfew, which isn’t even addressed in the motion. This goes further to the point where you connect those who are “good citizens” with those who would break the law of a curfew. This fails to counter the fact that a blanket curfew also targets “good citizens”. The notion that suddenly a curfew would mean “good citizens” would obey the law and stay at home and all the “bad citizens” would be in the streets where they can be processed is to deny the effect of a blanket curfew (it could be argued that those with a legitimate excuse are immune but what is a legitimate excuse? And how could it not be used by those who are not “good” citizens? And why should we assume all young people out at night are “bad”?). Fourth, your statement that Alderman Clark “wants proof that the problem exists” is a gross distortion of the facts set out in the article, where Ald Clark said that “evidence was needed” in terms of assessing media articles. Hardly the search for proof that a “problem exists”. (Further, reference is made to a comment that youth crime has dropped by 15% in the last few months but I can’t seem to locate this reference in the article). Fifth, you claim that those against the motion have no “empathy, compassion or regard for the kids who roam and give up their lives to the streets at night”. You further claim that those against the motion have no “respect or regard for the citizenry of the town, many of whom spend sleepless nights in terror of being victimised by these kids”. A disgraceful comment and gutter politics at its worst. (Refer to the second point above). It also follows a similar scenario where those who questioned the effectiveness (and allocation) of $1.8b of Commonwealth money in the name of “protecting children” were labelled supporters of abuse. Sixth, name calling such as saying a position is an “arrogant, disgusting insult”, and that those who question a curfew are “petty”, “stupid”, “shameful”, and that those on Council are “petty squabbling councillors” demonstrate that you are incapable of engaging in the debate. Saying that Councillors are motivated by interests other than that of the care of children, and only political motivations against other certain Councillors, is laughable. Again, none the reasons put against the motion were responded to. Finally, the notion that an elected Councillor who supported a motion for a blanket youth curfew, regardless of whether the motion was successful or not, could walk away feeling that they did “ANYTHING AND EVERYTHING (OR EVEN SOMETHING)” to look after children is the precise, degenerative way of thinking which gives my fellow Councillors conviction. Also, Hal, your claim that there was no mention of race until I called the “race card” is incorrect. After about thirty minutes of debate two supporters of the motion started talked about Aboriginal children (and issues). The comments drew the same inference by others in the media which basically says that those who disagree with the curfew do so because they want to treat Aboriginal youth “different”, because they’re Aboriginal, and, in turn, these same people condone vulnerable young people being unsafe. There was no mention of anything “Aboriginal” until the two supporters of the motion explored this angle (and for their political benefit), so what I did was to name this fact. It was responded by statements about believing in “integration”, “mixing with Aboriginal families”, etc. All I did was to name this fact. I didn’t mean it in a negative light or to disparage anyone’s beliefs, only to counter the inference drawn that Aldermen aren’t capable of considering vulnerable youth regardless of background as being vulnerable and in need of effective policies. This line of argument is a racial dimension to the main point put by those in favour of the motion that those who disagree don’t care about the protection and care of children. I named it and would do it again. Hardly a cheap shot in the face of the accusations made. And Hal, I wasn’t referring to the wording of the motion. I do appreciate your comments though. I was one of the few in the gallery last Monday night, and I felt the issue was discussed exhaustively. To declare myself, I do not think a youth curfew would be a good idea in Alice simply because the destination is lacking. Where would any offender be taken? Who, other than the police, would be looking after them? Once dropped off somewhere, what would keep them from walking straight back out into the night? Under what authority would / could they be detained? But I also did not hear a race card being played. A bit of a cheap shot, that one. As clearly stated in the motion, it would be a blanket curfew for all youth found on the streets between certain hours. There was no mention of race that I can recall before “race card” was used as an accusation against the movers and supporters of the motion. As reported above, an interesting point was made by the Mayor when he noted that some would advocate a blanket curfew but not any of several blanket restrictions on alcohol discussed at different times by this council. It was a good debate, and Alderman Taylor deserves credit for chairing a difficult, fractious committee meeting. I have never read an article that has given me a more sickening sense of shame. Shame at the pettiness, shame at the shear stupidity, and shame at the completely compassionless betrayal of a town and its children by its so called representatives. Of course a curfew isn’t “the” answer to everything, it’s simply a tool to both assist and force our various agencies to deal with a problem that they, and now our aldermen, refuse to address. I am completely gob-smacked by Sandy Taylor’s closing quote: “Those most in need of Social Support are those most likely to be subject to a curfew and most likely to fail its conditions.” Well what can I say “Ah Derrr, Sandy”. That is and always was the intention of a curfew! Those that are good citizens and who obey the law do as it commands and stay off the street. So that means the ones on the streets are the ones you want to deal with! The ones without parental control or without a home! Of course they’re the focus of the curfew, that’s the whole bloody point of the curfew isn’t it? But what absolutely disgusts me is the willingness of our councillors to put petty hates and jealousy above the welfare of our town and more importantly above the welfare of our children. Jane Clark actually wants proof that our problem with youth exists! This despite the thousands of articles, radio and TV commentary, a flowing conversation of admissions by police and other agencies reports such as Little Children are Sacred, millions of dollars poured by a very reluctant government into various agencies to address the issue, not to mention of course the literally thousands of reported crimes, bashings and break-ins inflicted on the poor citizens of this town. Even the Prime Minister knows about it but not apparently Jane Clark! What an arrogant disgusting insult to the citizens of this town who have lived with the daily trauma created by this problem for years. Oh, and you don’t think it’s that bad anymore? It’s dropped by 15% apparently in the past few months. That’s fantastic, is it? That means the rate is now only up by about 485% over the past eight years – we really are going places aren’t we! And somewhere in there you talked about a more intelligent sophisticated solution! So where is it? Where was all the work on that? I think for a bunch of petty squabbling councillors the idea of an intelligent solution may well be the perfect working example of an oxymoron with the emphasis on the word moron. The facts are you undermined and ridiculed this motion because of your petty dislike for new chum Eli Melky, and if that’s not bad enough, you did it without any empathy, compassion or regard for the kids who roam and give up their lives to the streets at night. You did it without any respect or regard for the citizenry of the town, many of whom spend sleepless nights in terror of being victimised by these kids, and you did it without any respect for the position you hold. As a person who has put an enormous amount of time into backing many of you, who worked very hard at getting you there in the first place, as a person who talked you up when many others thought you were crap, I now feel a real sense of shame that you have allowed yourselves to become so compromised that you can no longer see the woods for the trees. Ald Rawnsley understood the feelings of many parents, self included, when he pointed out that a rule needs to have a consequence if the rule is broken. Many parents fall short of reasonable consequences they can apply, when rather than discussing matters, their teens walk away muttering they do not have to listen. I am impressed with the detail of Kieran’s report … most informative for those who could not be there. I am also impressed with the reported comments made by those councillors who opposed the populist and simplistic call for a curfew.